Check out our Campaign Gallery with Photos with Constituents just like you! I promise to bring back common sense to District 4. I've traveled all throughout District 4 from Las Vegas to the rural parts of the District. 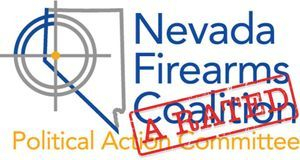 I have seen the affects of incompetent leadership that has economically crippled parts of rural Nevada. I experience the great bureaucracy first hand living in Las Vegas. We can do better, we must. Many republicans chose alternative candidates under the Libertarian or Independent American Party to throw out the RINOs in 2016, 2014, and 2012. 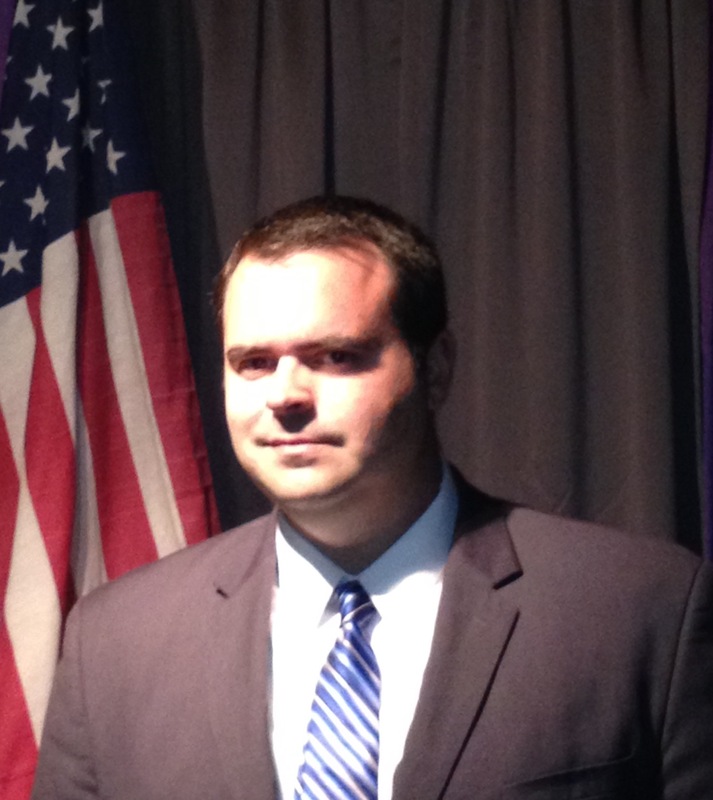 I am the conservative Republican candidate you've been asking for to replace the RINOs in Congress. I am not a RINO (Republican in Name Only). What you see is what you get with me, a true Conservative who loves God, family, and Nevada. I am not a politician, I am a businessman. I help run the most successful horseback riding company in Las Vegas, I understand the importance of tourism in our state. Our company works hand in hand with the service industry. I know what it's like to work on the Strip. I worked my way up from an entry level position of a shuttle bus driver and now am Vice President of Operations. I know the rewards of working hard to be successful and the need to provide for our families. I am the product of the American Dream. Having lived in Northern Nevada, I understand the importance of the mining and ranching communities. I know what it means to live in rural Nevada and have to drive 200 miles for adequate healthcare. I've been out there trapping gophers for the ranchers in Winnemucca. I have caught rainbow trout in Ely at Cave Lake. I have bought candy from the Death Valley Candy Store in Beatty. I've walked the streets of Goldfield. I have walked the Main drag of Tonopah several times meeting with business owners and community leaders. I have contributed to the economy in Mesquite as we went to see the in-laws in St. George and Salt Lake. I have rode horses through the Moapa Valley alongside the Virgin River. In other words, I understand Nevada. Not just one side of it. I understand the needs of District 4. I truly am the best man to elect to Congress to represent you in Nevada. 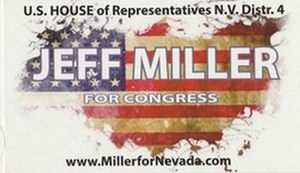 I am Jeff Miller and I'm asking for your vote and your support for 2018 to bring common sense back to Nevada. I also would like to ask for your help in this campaign financially because I am running against NEVER TRUMPER Cresent Hardy. The same Cresent Hardy who voted to give illegals driving licenses and voted to increase taxes for Clark County, and also voted to enlarge the surveillance blanket against Americans without a search warrant. Let us not forget that Cresent Hardy also said on May 30th, 2015 at the Libertarian Party Expo held at the Tropicana, "Disabled children are a drain upon society." Cresent Hardy has no plans to put District 4 first or support our President. He hasn't in the past and there's absolutely nothing that has lead us to believe he has changed. I will have the Harry Reid Machine as well as the whole Democrat party breathing down my neck in the General Election. Please support our campaign for Congress if the Lord leads you. I promise to fight for the people, because I am one. 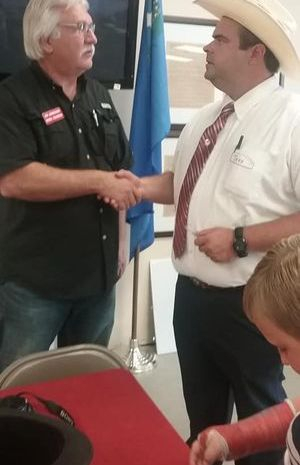 Jeff Miller and Joe Burdzinski at the Nye County Republican Committee in June, 2017. 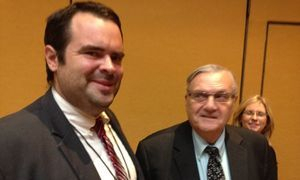 Picture taken after Jeff addressed the Nye County Republicans in Pahrump on why he should be elected to US Congress. 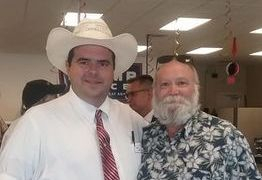 2016: Buck McNeely, television host of Outdoorsman, International seen weekly across the United States, endorsing Jeff for US Congress in Las Vegas, Nevada. Jeff and Buck with a special message for Nevada! You MUST be a Registered Republican to Vote for Me.